NI LabVIEW™ is the standard used by professionals the world over for test and measurement. 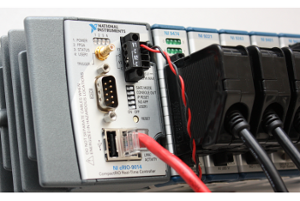 Integrated Pro specializes in setting up data acquisition systems powered by NI LabVIEW and NI TestStand in support of many different test and measurement scenarios ranging from a laboratory environment or industrial setting, to a field location or vehicle test. Depending on your needs, we can either provide one of our portable multi-channel measurement systems to acquire vibration, acoustic, strain, pressure, temperature, humidity, or many other types of data, or we can help you design and configure your own customized measurement system based on NI CompactDAQ, NI CompactRIO, NI PXI, or other data acquisition platforms. If required, we can support your test by employing the capabilities of DS Solidworks® Simulation Premium to simulate a wide variety of mechanical or mechatronic components, assemblies or systems for validation or confirmation of your empirical results. 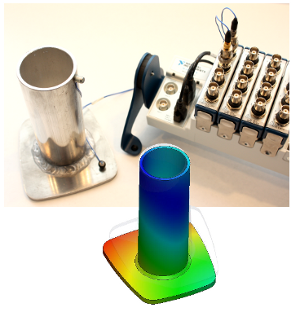 Combined with the flexibility of NI LabVIEW data acquisition systems to acquire and store the data, analyze and display it, and perform programmable functions such as scientific and statistical calculations, we can create models and reports or provide any other results that you specify. NI LabVIEW™ Real-Time is an extremely capable platform for control and automation system design. Coupled with a robust, industrial-grade, programmable automation controller (PAC) such as the NI CompactRIO, LabVIEW-based control systems can meet a wide variety of needs including multiple functionality domains such as digital logic, motion control, PID control, and process control. We can help you design, install, commission and support a LabVIEW-based control and automation system. Integrated Pro is a National Instruments Certified Alliance Partner and uses NI LabVIEW™, NI LabVIEW™ Real-Time, NI SoftMotion, NI TestStand, NI CompactDAQ, NI CompactRIO, NI PXI and other National Instruments hardware and software products in support of our clients. According to your needs we can provide LabVIEW programming created by an experienced, Certified LabVIEW Developer (CLD), customized for your installation and developed to your specifications and professionally maintained by our engineering staff. Some of our clients are themselves interested in developing their own in-house programming capabilities, but need some help getting started and putting training into practice. We work with them to set up their own systems and give LabVIEW programming hands-on help to help their programmers overcome obstacles and get up to speed. To learn more about the capabilities of NI LabVIEW, visit: http://www.ni.com/labview or Contact Us to discuss your needs.